A patio for unwinding. Modern meeting rooms for working. Rooms with contemporary style for relaxing. Friendliness, authenticity and simplicity. These are our values. Make yourself at home! 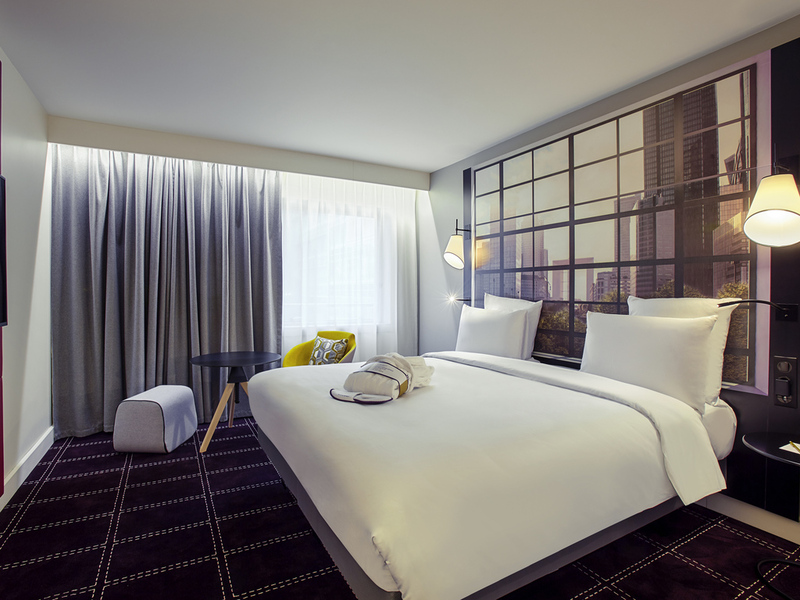 The Mercure Paris La Défense Grande Arche hotel welcomes tourists and business travelers alike. It is located 55 yards (50 m) from the Nanterre Préfecture RER A train station, 219 yards (200 m) from the U Arena, home to numerous sporting events, and 328 yards (300 m) from the Grande Arche. Les Quatre Temps shopping center is a 10-minute walk away. Take advantage of our rooms, fitness center and interior terrace. We also have 11 seminar rooms. At the heart of La Défense and next to the RER train station, the Hôtel & Résidence Mercure Paris La Défense Grand Arche is ideal for exploring the downtown area and its surroundings. In 10 minutes, you will find yourself strolling down Champs-Élysées. Choose the type of room that suits you best: Privilege Rooms offer a wide range of services (Nespresso machine, iHome dock, 42" TV), while Standard Rooms are renovated in a modern and inviting style. We also have studios & apartments which offer independence, whether traveling alone or with others, with hotel services (room service, dry-cleaning service, fitness center, fully-equipped kitchen), according to your requirements & the length of your stay. Our restaurant offers traditional French cuisine in a welcoming setting. Enjoy a moment of relaxation on our interior terrace. Temporarily closed for renovation work from January 4 to May 13, 2018 inclusive. The City Zen Bar, a peaceful and friendly place. The ideal place to unwind or for business meetings, with direct access to the indoor terrace.